Delicious Peanut Butter Cookies shaped like Rudolph and all his friends! 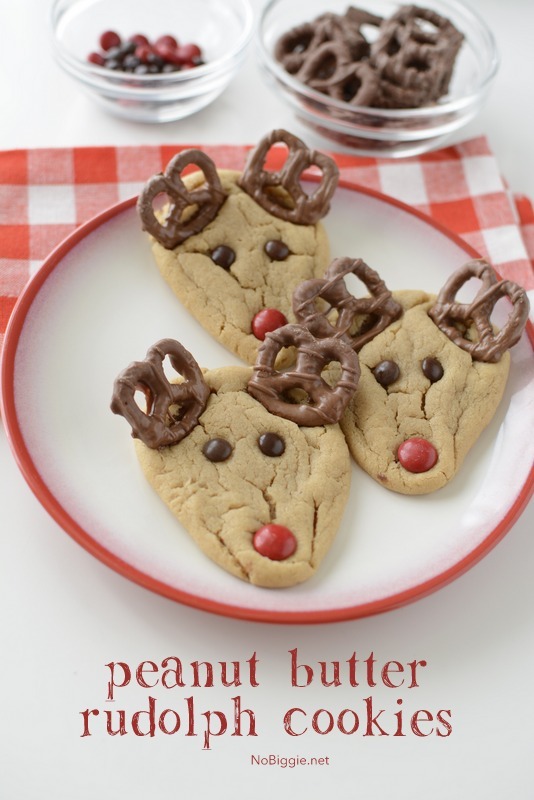 We made a fun video to go along with these cute peanut butter Rudolph cookies. 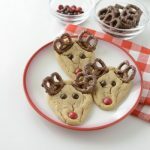 If you’re planning to attend a Christmas Cookie Exchange this year, these cookies would be the cutest cookies on the table, not to mention delicious! Let the holiday baking begin! 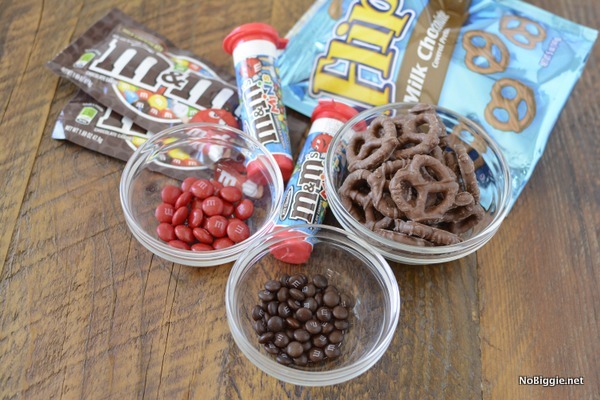 The key to these cookies is to add the chocolate covered pretzels and m&m’s to the cookies while they’re still warm from baking in the oven. If you wait too long, they are not as easily added in. To play it safe, I bought a few extra bags of M&M’s and mini M&M’s. I ended up needing all the bags I bought. Just a fun little How-To video to show you how easy they are to make. Combine brown sugar, peanut butter, shortening, milk, and vanilla in your mixing bowl. Beat at medium speed until well blended. Add egg; beat just blended. In a separate bowl, combine flour, baking soda, and salt. Add this to creamed mixture at low speed. Mix just until blended together. Using an ice cream scoop, scoop out 1-inch balls of cookie dough and place on a parchment lined baking pan. 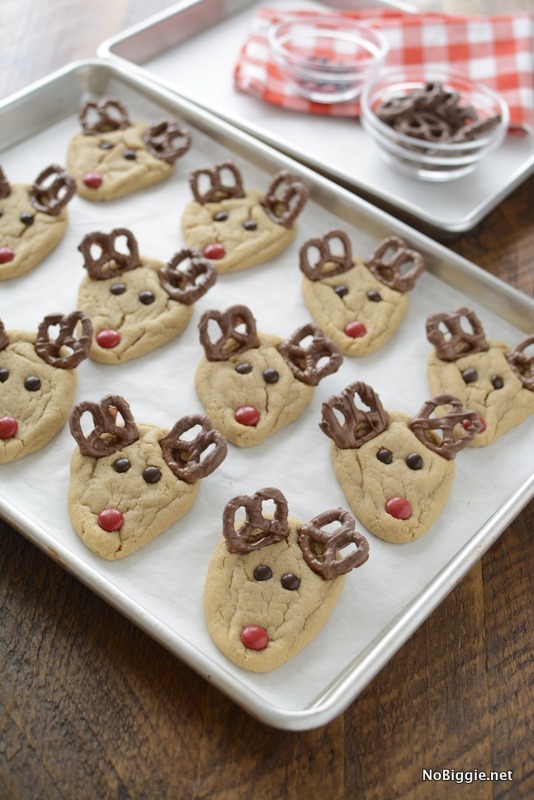 To make reindeer-shaped cookies, pinch the bottom of the cookie dough ball slightly to form a pointy triangle shape, then gently flatten with the palm of your hand. Space cookies about 2 inches apart on your bakin sheet and bake for 7 to 8 minutes, until set or just beginning to brown. 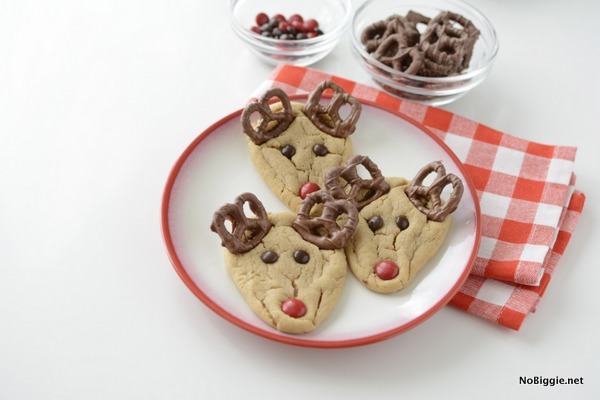 Remove from oven and immediately (and gently) press two chocolate covered pretzels into the tops of the cookies for reindeer antlers. Press two mini brown M&Ms in for the eyes and one red M&M for the Rudolph nose. If you run out of red M&M's for the noses, you could use brown and green M&M's too. 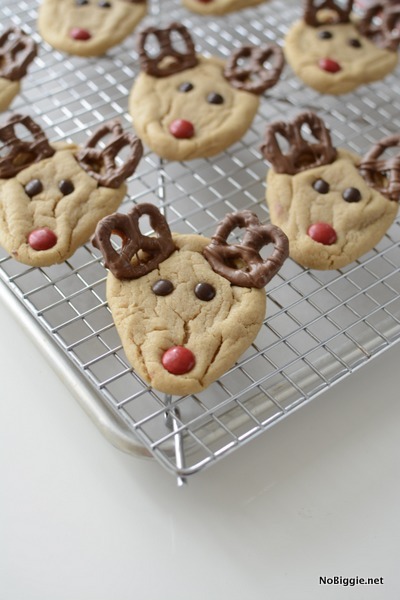 We made these other Reindeer Cookies when my kids were little and they are both fun! Looking for more Christmas Cookie recipes? You’ll love this list of 25+ Christmas Cookie Recipes.